A ceramic tile floor can have a modern look. Pharaohs were among the first to use ceramic tiles in the construction and decoration of their pyramids as early as 2600 BC. It later caught on throughout Europe and the United States. The United States began manufacturing tiles on an industrial scale with the invention of kilns and the ability to fire the clay, and it has since become a versatile material that is both functionally and aesthetically pleasing. Although it is thought of as a more contemporary material, ceramic can easily create a more traditional appeal with warm colors and designs. Ceramic has many benefits that make it a perfect fit for any lifestyle. 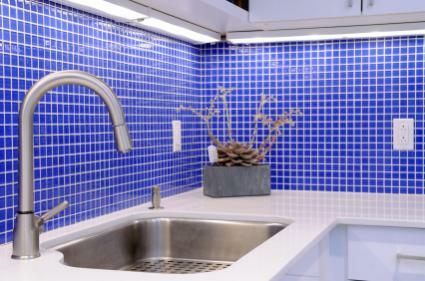 Typically, you will find ceramic tile as a backsplash in a kitchen or on a floor in the kitchen or bath because of its ability to resist stains and spills. More and more people are opting to use it on countertops due to its resistance to wear. However, because of its beauty and artistic features, it is also being found on walls. More uses that are growing in popularity are in crafts, wall and tile murals, and for pools and paving. Contemplate the project at hand. Where will your tiles be used? Are they purely decoration, or will they be functional as well? Whether your tile will be used as a decorative mural or kitchen counter top, think about the color scheme and décor of the room it will be in. The tile should compliment the furniture, paint, and overall design of the house. You should also note that grout that matches the color of the tile is easier to clean and will hide dirt in high-traffic areas better. These are just a few things you should look into when deciding on the type of tile to use. Cost should be thought of as well when choosing tile for your home improvement project. Ceramic tiles can be reasonably priced, but plan on paying more for something with an intricate design or pattern. Your prices for tile will also depend on the sizes and styles of the tiles available. You can customize most any project at a moderate cost. Though installation prices have risen slightly over the years, the overall cost is still lower than most types of flooring, if that is your intended use. Durability - Tile can often last a lifetime if properly cared for. Easy to maintain - Aside from grout, it is easy to clean and resists most stains and moisture. Adaptable - You can use tile for fireplaces, backsplashes, floors, and walls, indoor and out. Cost Effective - Since it is so impervious, the cost of replacement is still considerably lower than other surfaces and flooring. Ceramic offers endless opportunities. For each and every way to use it, there are thousands of styles and varieties to choose from. There is no limit on how to customize tile. The only real limit is your imagination. Tiles can come glazed or unfinished for a more rustic look. You can choose a basic neutral color for the bulk of a countertop and portion off a section for a colorful design. The same can be done with floors or trim work around walls. Likewise, you can choose to have unglazed tile which has a rougher texture to it and isn't as slippery when it gets wet. This would be a plus when deciding what type of tile to choose for a bathroom floor. It doesn't matter how you choose to use tile in decorating and improving your home. Ceramic tile can add to the resale value of your home since it is a strong, practical surface. It does not hold allergens or bacteria, and it is also fire resistant, and does not emit harmful fumes. Each of these points add to the long-lasting beauty and appeal that ceramic has to offer.